Lindsay Lohan Arrest Warrant Issued. And Revoked. Arg!! As I’m sure you’ve heard by now, there’s a warrant out for Lindsay Lohan’s arrest. As there should be!! If it were up to me, Lindsay would go ballistic at the airport and have to be maced or tazed and then taken down like some crazy crack-whore on PCP. Sadly, I don’t think that will happen, but girl can still dream…..
First she slaps the justice system in the face and takes off to Cannes knowing full well she had a court date just days later. Then she claimed someone stole her passport while in Cannes. The French police – along with everyone else – immediately called Lindsay’s bluff. Having been caught in that lie, Lindsay decided to tell anyone who will listen that her father Michael Lohan hired someone to steal her passport. Seriously. Oh, Lindsay Lohan also blamed the volcano as the reason she couldn’t get back to Los Angeles in time. 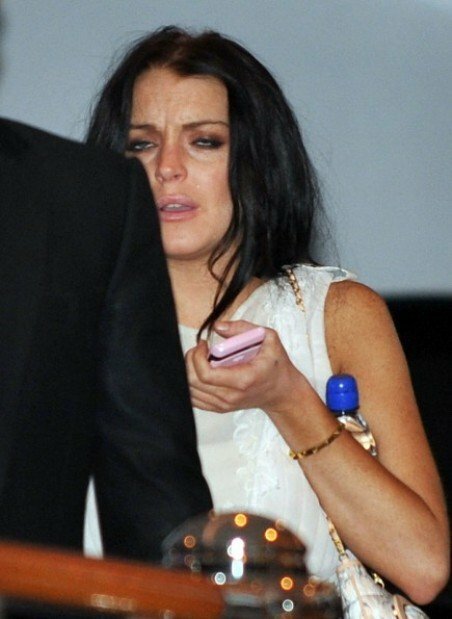 Obviously Lindsay Lohan did not show up for her required court appearance this morning and a bench warrant was issued. Bench Warrant Issued for Lindsay Lohan – Yeeeah! So now all we can do is sit on the edge of our seats in great anticipation of Lindsay’s return to U.S.
TMZ has learned Lindsay Lohan will not be arrested, because she has already posted bail and the arrest warrant has been recalled. Earlier today the judge set the bail at $100,000. We’re told Lindsay’s people promptly plunked down $10,000 (the standard 10%) to secure the bond and the judge then recalled the warrant — meaning Lindsay will not be arrested when she returns to the U.S.
We’re told Lindsay and her lawyer, Shawn Chapman Holley, will be in court on Monday at 8:30 AM. The judge will then set a date for a probation violation hearing. Judge Marsha Revel said this morning there was probable cause to believe Lindsay has violated the terms of her probation. Boooooo!!!! Unlike! Unlike! I was hoping to see Lindsay Lohan in handcuffs. Sigh. Fingers crossed she gets the book thrown at her on Monday! Lindsay is, after all, in clear violation of her probation. Just sayin’. next post: Bret Michaels Hospitalized. Again. 50 queries in 0.868 seconds.